Quick Absorbers Geffen Absorbers are the only Universal Diaper Insert on the market made with our unique blend of 60% Hemp / 40% Organic Cotton jersey. The added hemp content allows for added strength, absorbency, durability & anti-mildew and anti-microbial properties. Our inserts are made to be compatible with all brands of cloth diapers. 5 layers of Quick absorbent, very soft 60% Hemp 40% organic cotton Jersey. I use the quick absorbers plus and the super absorbers together in my EBB diapers and they are so wonderful and absorbant! Love them and can't wait to order more of them! Give them a try !!! I'm really loving Geffen products! I've been using these as inserts along with an AppleCheeks bamboo booster for long car rides and shopping trips. They are very trim and fit nicely in our narrower diapers. Haven't had a leak yet! Super thin and great absorption!! They fit well in little diapers. My favourite boosters hands down! Absorb so much without too much bulk! 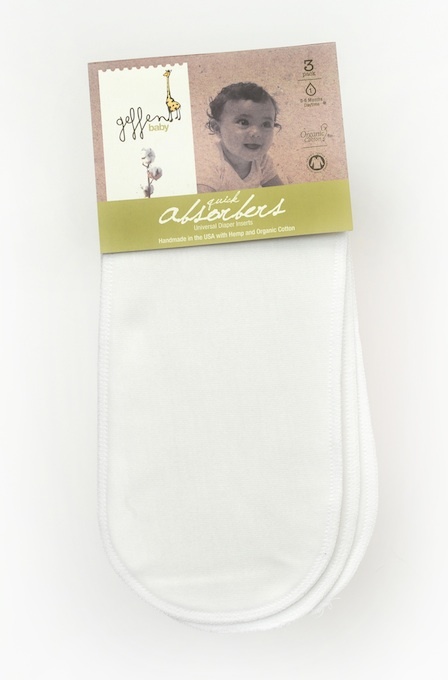 They wash and fluff well, are gentle on baby's bum and are always the first ones I reach for! These are great for night time and hold a lot of liquid. The main downside is that they are very slow drying (normal for hemp) and get crumpled/wrinkly in the drier. These work just as well but I do prefer the softness of the fleece super absorbers. We use these in prefolds regularly and they are great workhorse boosters, probably my favourites. Great booster, especially for medium wetters. Holds shap especially well. A: 1 pack of Quick Plus will fit for Lettermail shipping. Q: May I have the length and the width of these? I need to see if it fits in my diaper covers. Thanks! A: 5 1/2" wide, unwashed.